Two women go on the run after escaping from a psychiatric institution. Paolo Virzi is one of Italy's most prolific filmmakers, delivering a new film at a rate of every two years for the past couple of decades. After a series of colloquial comedies, he scored an international breakout with 2014's standout Human Capital, a scathing drama and arguably the best cinematic commentary on the effects of the 2008 financial crisis to emerge from Europe since that damaging event. 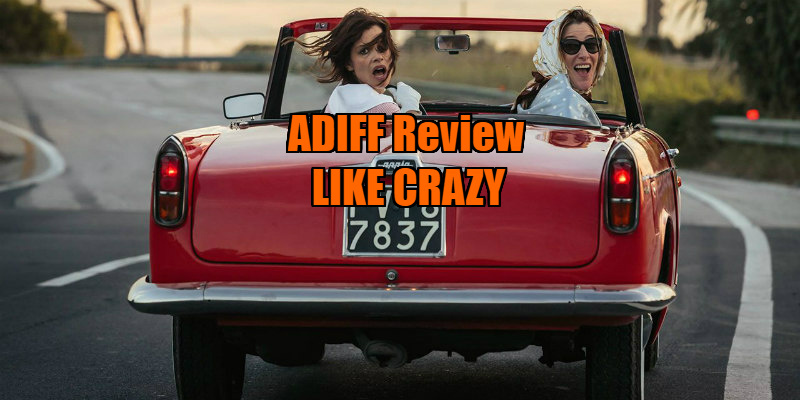 His followup, Like Crazy, sees Virzi return to comedy, and sadly to mediocrity, with an uninspired road movie that plays like a second rate Italian homage to Ridley Scott's Thelma & Louise. The saving grace of Virzi's film is his reteaming with his Human Capital star, the captivating actress Valeria Bruni Tedeschi. Here she plays Beatrice, an inmate of a Tuscan psychiatric institution who boasts of her aristocratic lineage and a past life of hobnobbing with the elite; a closeup of her phone shows an entry for George Clooney, his name tellingly entered in block capitals. She may spend her days moaning at the staff and treating her fellow inmates like her servants, but Beatrice seems content enough. That's until the arrival of Donatella (Micaela Ramazzotti), a troubled young woman with a history of attempted suicides. Beatrice takes her under her wing and learns of Donatella's desire for a reunion with the young son she was forced to give up for adoption. While working at a local nursery, the two seize the opportunity to make their escape, setting off on a road trip to find Donatella's child. As Beatrice, Tedeschi is a force of nature, her snobby soccer Mom ways often provoking hilarity as she swans across Italy with her delusions of grandeur and superiority complex. The film is a little too in love with Beatrice however, to the detriment of Donatella, who is given far less time in the spotlight and never comes across as anything other than a tattooed caricature, and the less experienced Ramazotti struggles to hold her own against her dominant co-star (Ramazotti is married to the director; make of that what you will). Like Crazy lacks the sort of memorable sequences required for a road movie, and the characters Beatrice and Donatello run into along the way are instantly forgettable. It's only the movie's genuinely touching climax that hints at the tender and thoughtful drama Virzi's film might have been. Like Crazy played at the Audi Dublin International Film Festival. A UK/ROI release has yet to be announced.